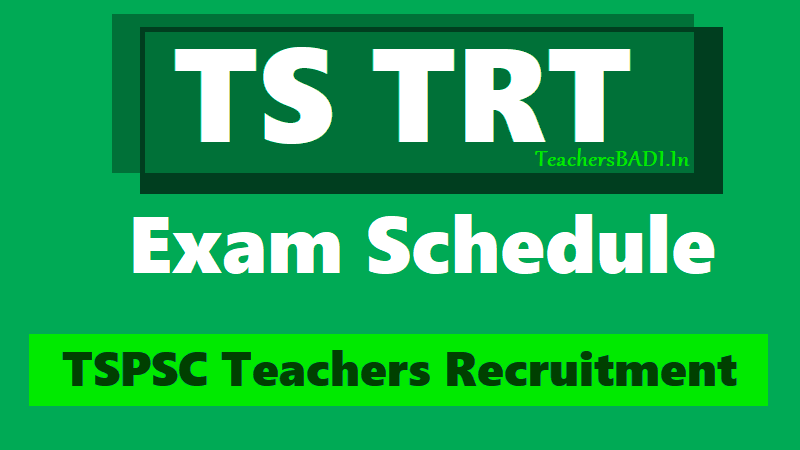 TSTRT Hall tickets, TSPSC TRT Hall tickets, TS Teachers Recruitment test Hall tickets, TS TRT Exam Schedule for TSPSC Teachers Recruitment 2018, TS TRT Exam centres, SGT, PET, LP, SA, SA P.Ed Teachers Recruitment Exam dates, TS TRT Exam centers, TS TRT Exam mode. TSPSC teachers recruitment test Schedule released, TS TRT exams start from February 24 to March 4. (TS TRT Exam Schedule for TSPSC Teachers Recruitment 2018)Telangana State Public Service Commission (TSPSC) has released the schedule of the written tests for recruitment to various teaching posts advertised by the commission in October 2017 (Notification Nos. 52/2017 to 56/2017). The TSPSC release gives the date of the examination along with other details like: type of examination (CBRT or OMR), subject, medium of examination, session (Forenoon (FN) or Afternoon (AN) and exam Centres. TSPSC TRT hall tickets / TS TRT admit cards : The Telangana State Public Service Commission (TSPSC) will on February 19 release the admit card/hall ticket of the written tests for recruitment to various teaching posts advertised by the commission in October 2017 (Notification Nos. 52/2017 to 56/2017). The admit card was expected to be out by 3pm, but no link for it can be seen on the website until now (6,10pm). The TSPSC notification now says that the hall ticket download will be available after 7pm. The notification for the exam released on October 21, 2017 was for the recruitment of approximately 8,792 teachers in the School Education Department of the state. Out of the 8,792 vacancies announced, 5,415 were for secondary grade teacher, 1,941 for school assistants, 1,011 for Language Pandits, 416 for Physical Education Teachers and nine vacancies for school assistants (physical education). Note: Visit the official website of TSPSC for latest updates. TS TRT Hall tickets: TSPSC TRT Hall tickets, TS TRT Hall tickets, TSPSC Teachers Recruitment Hall tickets, TS TRT Teachers Recruitment Hall tickets, TSPSC SGT SA LP PET SA PEd Teachers Recruitment Hall tickets: TS TRT Hall tickets would be available from 19-02-2018. Candidates can download the TSPSC Hall tickets from the TSTRT Official website: tspsc.gov.in. The Telangana State Public Service Commission (TSPSC) will on February 19 release the admit card/hall ticket of the written tests for recruitment to various teaching posts advertised by the commission in October 2017 (Notification Nos. 52/2017 to 56/2017). The entrance tests will be held between February 24 and March 4, 2018. The notification for the exam released on October 21, 2017 was for the recruitment of approximately 8,792 teachers in the School Education Department of the state. Out of the 8,792 vacancies announced, 5,415 were for secondary grade teacher, 1,941 for school assistants, 1,011 for Language Pandits, 416 for Physical Education Teachers and nine vacancies for school assistants (physical education). Step 7: Download it on your computer and take a print out of the same. Candidates applying for School Assistants, Language Pandits and Secondary Grade Teachers will be selected on the basis of combined marks secured in the written examination to be conducted by the TSPSC (80%) and Teachers Eligibility Test (TET) (20%). Candidates applying for Physical Education Teacher (PET) and School Assistants (Physical Education), will be selected on the basis of marks secured in the written examination. Note: Visit the official website of TSPSC for latest updates. Online, Offline examinations are conducted (CBRT or OMR). The entrance tests will be held between February 24 and March 4, 2018. Candidates can check the schedule by going to the bottom of the story. On the first day of the test, candidates who have applied for language pandit posts will appear for the Telugu paper in the forenoon (FN) session, while candidates who have applied for school assistant posts will take Telugu paper exam in the afternoon (AN) session. The notification released on October 21, 2017 was for the recruitment of approximately 8,792 teachers in the School Education Department of the state. Out of the 8,792 vacancies announced, 5,415 were for secondary grade teacher, 1,941 for school assistants, 1,011 for Language Pandits, 416 for Physical Education Teachers and nine vacancies for school assistants (physical education). Candidates applying for School Assistants, Language Pandits and Secondary Grade Teachers will be selected on the basis of combined marks secured in the written examination to be conducted by the TSPSC (80%) and Teachers Eligibility Test (TET) (20%). Candidates applying for Physical Education Teacher (PET) and School Assistants (Physical Education), will be selected on the basis of marks secured in the written examination. Note: Visit official website of TSPSC for latest updates. Telangana State Public Service Commission (TSPSC) has published the exam schedule on the official website, the link for which is tspsc.gov.in. The exam will be held from February 24 and March 4. 15 52/2017 School Assistant Biological Science, Mathematics & Social Studies Telugu OMR 04/03/2018 FN Likely to be held in 10 District Centres or They may be reduced.